Two nights ago, despite the fact that the air outside was the pitch-perfect shade of Spring, we opted to hunker down inside. Neighborhood living demands this sometimes, and we're learning to listen. I baked strawberry shortcake and we queued up the new Netflix series, "Anne With an E."
I began blogging almost ten years ago. From the gates, there were a few things I caught onto, here in this online subculture. Everyone was gaga about drinking coffee (and wine,) a surprising number of people were runners, and quoting lines from Anne of Green Gables served as a sly litmus test for friendship compatibility. Not surprisingly, I failed at all three. I couldn't order a specialty coffee drink if my life depended on it, all wine smells the same to me (bad,) and the only things I knew about Anne were that she had red hair, was quirky and bookish, and tossed around the phrase "kindred spirit." When Ruby and I attended the high school performance of the play last year, she spent the two hours utterly transfixed while I spent them spackling the holes in my Anne deficiency with newfound context. Anne was an orphan. She was adopted by an older brother/sister duo, and she had a classic love/hate romantic interest named Gilbert. I still had a lot of catching up to do. Netflix's "Anne with an E" stopped me in my tracks just a few moments in. I wasn't in full-journalistic mode (yet,) so I'm paraphrasing here, but she says something along the lines of, "I have never had cause to belong to someone." This is the language of my heart, this desperate longing to be known, to be chosen, to be seen and valued. This is the unspoken pulse shuffling down my streets. It knocks at my door. It rattles in its cell. It calls me up after dark and during the most inconvenient hours of my workday. I know this pain, mostly secondhand. I could pluck its voice from a crowd. We continued watching, Calvin and Ruby rapt on either side of me. Through flashbacks of abuse, gut-wrenching sobs, tension tight as a cello's bow, I was grateful for a family-friendly show that didn't dodge the realities of trauma. I was beginning to understand the appeal, and surprised I'd never known the depth of the story. Later I learned about the ire the adaptation is drawing, Anne's loyal fans in full despair that the show has taken a darker turn than the original. I'm in no position to draw comparisons or critique the remake. All I can tell you is that I exhaled. Finally. My heart, its resting state always at least half on-edge for the lonely and the suffering, snapped awake with hope. I felt a certain kinship with the droves of women who have held this story to their chests. Maybe we were kindred spirits all along, and I just hadn't known. I took notes as we rode along in the horse-drawn wagon with Anne and Matthew, their hopefulness electric for different reasons. Anne imagines a future whose luck has finally turned. She's about to cash in on every injustice the world has dealt her. At last, she is wanted. Someone came for her. She will be loved. "Home," she sighs. "What a wonderful word." This is what we come for, right? This is why we're here, to watch this lush Canadian unfolding of a wholesome, newborn family, before our tender eyes. We want it, but only from a safe distance. Why? Why does our compassion for the orphan, the poor, the difficult, the cast-out, so often meets its capacity before we've crossed over from hypothetical to real-life messy? How can we root for Anne, cry real tears for her, love her with our whole hearts, dream about sharing her with our daughters one day, yet be so disinclined to invite her into our actual homes? I know so many Annes with an E.
This morning I drove an Anne to a church food pantry downtown. I stood awkwardly at the periphery, twitchy-skinned from my nearness to her need. I watched as she was kindly told she could take two items from each bin - two boxes of off-brand spaghetti, two cans of tuna, two boxes of rice, two cans of peas. She moved haltingly, hesitant to accept all that was offered. She made eye contact, thanked the older woman profusely, attempted small talk. I watched and waited, trying not to feel too much. I know an Anne who gets four hours of free time every week, but has no where to spend it. "You're the only sober people I know," she told me once, shrugging her shoulders. I know an Anne who is sixty-five years old, and needs the occasional comfort of chaos like she needs blood pressure meds and air. I know Annes with no teeth who smile anyway. I know Annes with tattooed necks and shredded confidence. I know Annes desperate for affordable housing, desperate for a job, desperate for someone to understand who they have been and love them anyway. I know so many Annes who fold in on themselves, dreaming up a new narrative because the real one scorched their long-term memory and they're scared to death of remembering. Their lake of shining waters is an income tax return, a debt finally paid, the baby growing in their uterus despite everyone saying they aren't ready, they'll never be ready, they won't do right by that baby. They wrap themselves in name-brand shirts and pretend to be kings. They choose new names because the one they were given has never been enough, never served them well. The Annes I love lash out with their words sometimes, but we don't applaud their resilience. We don't admire their quick wit or commend their courage. We call them crazy, not whimsical. They're disrespectful, not "sassy." "You can't make up a family. Only kin is kin," Marilla Cuthbert tells Anne upon her mistaken arrival. Anne already knows better. We all know better. We know how this story will end, and we cheer from under our Target throws, under our mortgaged roofs. Our hand hovers salty over the popcorn bowl and we smile. We watch Anne's family unfold, transfixed. Marilla has no idea! we think. She's so wrong! Is she wrong enough that we will prove it? I think we will. The biggest change is often measures in fractions, in blinks. It's long in the making and I'm encouraged. I read your emails and hear your stories. "What do we do?" you ask. "Where do we start?" We start right here, wherever our feet are standing. We start right now. We swallow Anne's raw backstory and begin to understand we can do that for anyone. We walk toward her discomfort, admitting along the way that maybe we ourselves are not "fine" after all. Not by a mile. Because if our hearts can ache for a literary heroine with wounds that reach the depths of despair, we can bleed for the heroes living just past our line of vision. 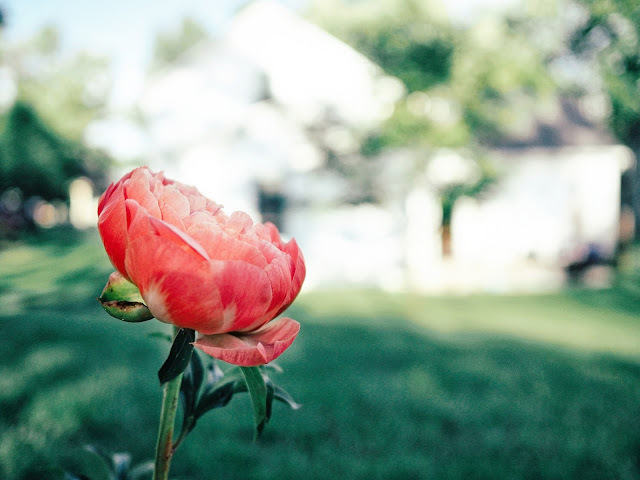 If we can wait with anticipation for Marilla to come around to authentic love and unconditional acceptance, we can find those in our midst lacking both and offer them with open hands. I'm only on the first episode, but my hunch is that this is no ordinary orphan tale, where Anne is the spit-shined project and the scales lurch off-center. I'm guessing the Cuthberts bear a burden of gratitude equal to Anne's, in it for the long haul, love unending. I know this in living color. If we think God is above tending to our souls through the glare of our TV screens, we are underestimating him. He will do whatever it takes, the earth, the air, the streaming and electric all firmly beneath his feet. He wants nothing more than to bless us, and he tells us how it will all go down. Poor, needy, sad, and humble. We will be blessed. Hungry, angsting, lavishing mercy. We will be blessed. Pure of heart. Dissatisfied with status quo. Exhausting our bodies for the sake of peace. We will be blessed. We will be blessed as we learn to love those he loves. We will be blessed as we trade our treasures and pay attention to what (and who) makes us cry. It's in us, I know it is. You can't convince me otherwise. All that's left to do is find our unsuspecting Anne out in her howling wilderness and choose it all, the tension, the practiced defenses, the inconveniences, the knotted roots, the mud, and the rain that sweeps it away. "What is your name?" we will ask. "What does it matter?" she'll counter. This will be our moment, the one where we cross over, climbing into the drama and heartbreak playing out in real time on the soil that grounds us. This will be the beginning of a very long story, an epic tale, where we simply stay until Anne stops asking, where our circle widens, and where we're all so much better for it in the end. YES!!! I have been watching this while eating lunch, but am deliberately slowing it down because I don't want it to end. There have been some profound lines. I imagine I will be watching it again. And "Dear Lord, PLEASE keep my eyes and ears open and then give me courage to act!" Yes! All the times I "slyly" talked about kindred spirits and you didn't know! As a Canadian, Anne is in my DNA. I loved this new version - we got it on television last month - just as much as the fluffier versions but you must read the book and the whole series. I was introduced to anne by my fifth grade teacher and I have never looked back. I have a friend who says all you need to know about life comes from Rachel Lind. 😀 and we all know an Anne with an E. Thank you! Watch the original full series that was on PBS a couple decades ago - so much better than the current version in my opinion. Thank you again and again - I always enjoy and learn from your posts but rarely comment. I hope my library will get "Anne with an E" but even if not, I am glad to know that this series exists and will introduce a new generation to Anne and her "family". I have several "Anne's" in my life and loving them isn't always easy...but they are so worth the effort! There are clips on the internet that show the scenes that are controversial and not from the books. They're sexually explicit. Anne is something all ages should be able to watch and enjoy. The heartbreak is shown and felt and all ages can empathize, the "orphanness" is real. Why they had to add this one scene in particular I don't know. It darkened something that was so light filled. There wasn't any reason to do this. Please read the books you'll REALLY fall in love and so will Ruby. For what it's worth, I don't think it's fair at all to characterize the one scene in question as "sexually explicit". Common Sense media gives it 4/5 stars for family friendliness and recommends it for kids ages 10+. They also write, "Dark themes don't overwhelm this stellar Green Gables retelling." Eh... I see your point, but I've heard people use similar arguments to justify watching all manner of things. "It's just realistic", etc. I dunno. Call me a lightweight, but I'll pass on this adaptation. A dear friend screened it for me and told me I couldn't handle it. The suffering in the world breaks my heart enough. I prefer the aspirational, whimsical Anne of the books and L.M. Montgomery's imagination. is she entirely realistic? Perhaps not. But gritty realism get wearing in art, and these days most film and t.v. -makers seem devoted to making things as dark and miserable as possible. That seems to be the overarching trend currently. Yes, there is darkness, plenty of it... but more importantly, there is resurrection, and it wins in the end. Btw, I just recently discovered you, and am totally falling in love with your beautiful writing and your story, so I kinda wish my first comment hadn't been a negative one...I just love the Anne book is so very much and hate it when whimsical things are tempered with darkness and grimness for the sake of supposed "realism". I just wish the tastemakers could let fairy tales be fairy tales. I think they're every bit as essential to our souls as stories of brokenness. The Megan Follows series and the Amybeth McNulty series differ from the book in opposite ways, that is true. There are things that are hinted at in the books which are spelt out a bit more. Anne's memories do show her fear of an unknown future - and she could have as easily been sent to the Blewetts as the Cuthberts. I think that the first season is about Anne getting used to the fact that being a Cuthbert is permanent. Josie Pye represents social control where people are punished for being different, for standing out and, at the beginning, she is in her glory. Slowly, people gravitate away from Josie and join team Anne. In the books, everyone is on team Anne from the beginning. If you are a kid starting a new school, this is the more hopeful version - that, it will take time, but you will make friends in the end. Some of the criticisms you have read have exaggerated certain parts and left out a lot of whimsical humour - or that when you see the tree full of flowers that Anne says looks like a bride, you see it too or that the lake of shining waters - you see how it got its name. You miss quite a bit of period humour. The show does do a bit of contrast - why Anne values Matthew's kind, gentle doting nature so much - and, unlike patriarchy, which dictates that a man's full value is in being a breadwinner, we see an Anne that is somehow smarter than patriarchy. We see an Anne that loves being part of a family more than puffed sleeves themselves. We see an Anne that, as long as she has a family who wants her and a few friends, fears nothing. Ok, the character who goes away for a short time is contrived - but they usually do that when the character being present would make events happen differently. Thank you, Lucette! This is helpful. Alas, we cancelled our Netflix subscription awhile back anyway so I will need to wait for it to show up at the library. Your review does give me pause about my dismissal of it though. It's not that I can't handle darkness in cinema, literature, etc... just that the greater the darkness, the heavier on redemptive themes I need something to be. And something about people inumbrating beloved characters for "updating's" sake just puts ne on guard. I so love the Anne books, perhaps precisely because she is such a romanticized, irrepressibly idealistic heroine. Something in my heart cries out "but I don't WANT realism, dang it!" I'll definitely consider those eps, though! Thanks again. I absolutely love your post, and while I am a diehard fan of the original, this new take has touched me, too. i'd never thought about AoGG from this perspective before today. thank you for speaking up for the IRL orphans and others who are quietly despairing, often pretending to be reslient, among us. i spent parts of two days this week at our local food pantry. it's a really good place to start for those looking to truly see those in their midst and choose to love first and ask questions later. Yes!! I have never read the series which is odd given my love of reading, but I have loved this adaptation. I am currently on episode 4 and it speaks to my heart so much for her intense love of life as much as her temper. I am glad they have honored the truth of what she would have known and been exposed to and that her intention is not to be naughty it is simply what she knows that she cannot unknow. Oh man, you nailed it. I'm a lover of the original Anne movies. But this adaptation? 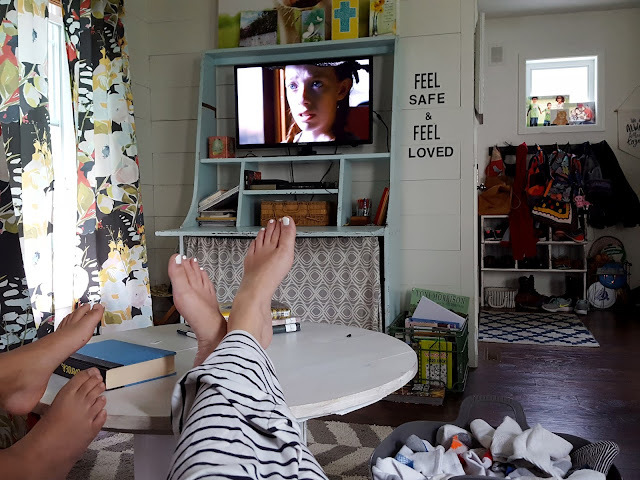 I snuggled up on the couch and watched it with my 2 girls adopted from foster care -- 11 and 17 -- both with their own stories of trauma and abuse and disappointments. They resonated with this girl, who didn't shy away from her feelings, but remained hopeful (even if she had to do that by crawling into her own head and making up her own world -- something my oldest is very adept at doing.) I know not everyone loved this version of the story, but for us, it was gut-wrenchingly real and that's why we loved it. Your blog made me cry. So true! Personally, I think Anne slowly winning everyone over is more hopeful than her walking into school and everyone automatically like her from the get go. It shows that just because something doesn't happen right away doesn't mean that it won't happen. And it makes sense to fear the worst (memories) while hoping for the best (words, imagination). There are some changes and some extra chapter, but find that I understand the characters better than ever before. There is the Anne who likes Matthew's sweet shy gentle nature (not traditional masculine qualities) and his ability to accept her and love her just the way she is much more than she loves puffed sleeves. Patriarchy only values a man as a breadwinner and if he is not that he is nothing. Anne is smarter than patriarchy in knowing what truly matters - what is truly important. She walked through the door, just like they said she would, and gave Matthew a big hug. All those who focus on Matthew attempt to engage in "breadwinner behaviour" miss that aspect of it - Anne walking through the door ... Anne saw the magic in things that people either didn't notice or took for granted. You nailed it!!!! Such a stellar post...I have long loved the book and earlier movies. But this new rendering captured the heart of the story. And your thoughts on it are going to stay a very long time with me.